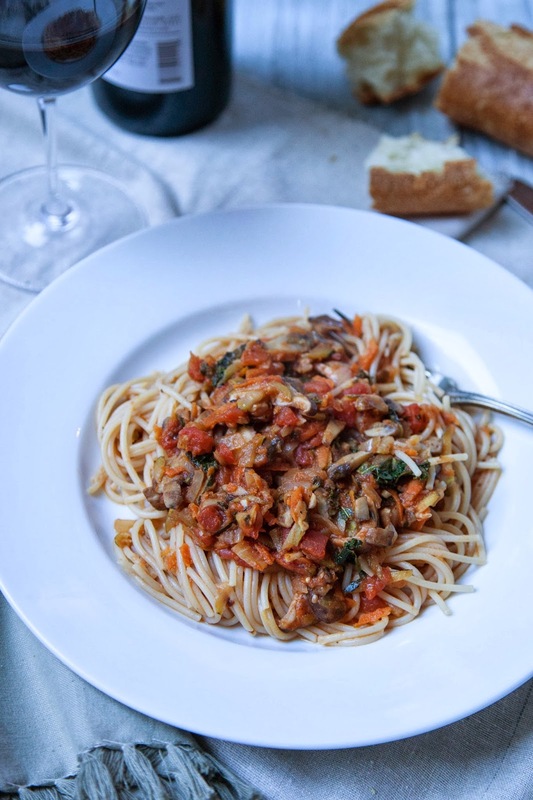 While some may turn their noses up at a spaghetti that doesn’t promise a rich crumble of savory sausage or red meat tossed and tumbled with a deeply stewed tomato sauce, this veggie variety is a satisfying, heart-healthy, 30-minute ticket to comfort. Not that dizzy, lethargic, take-a-nap variety, but a feel-good, satisfying, robust veggie one; one that doesn’t leave you laden with indulgent guilt. Think of it as a soft merino wool blanket that drapes lightly to ward off and soothe the chill and challenge of the day. It’s light, appealing, satisfying, warm, and welcoming. This one also happens to be gluten-free and dairy-free (assuming you refrain from the french baguette:). I use a little pad of vegan “butter” to silken the sauce, a veggie-based broth, and my favorite gluten-free spaghetti. Served up warm, straight off the stove, it’s quick, healthy, "no-snooze" comfort in just 30 minutes. Heat 2 tablespoon olive oil in a large skillet over medium heat. Add onion to skillet and sauté until just slightly translucent, about 2 minutes. Add additional 1 tablespoon of olive oil, along with garlic and mushrooms. Stir to combine and lightly coat with oil; then leave to brown for about 2 minutes; stirring only once or twice. Season mushroom mixture with salt and pepper; then add carrots and zucchini. Stir to combine; cook for about 2 minutes. Add kale and Italian seasoning. Cook for about 1 minute, until kale has wilted down. Add vegetable broth, wine, tomatoes, butter, and red pepper flakes. Reduce heat to a low simmer and continue to cook for an additional 15 to 20 minutes. Season sauce with additional salt and pepper, to taste. Meanwhile, cook pasta according to package directions, for an al dente consistency. 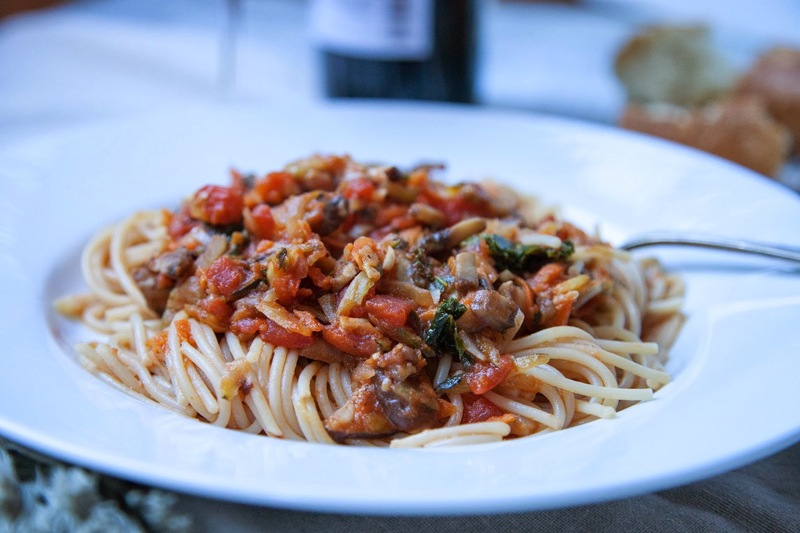 Add cooked and drained pasta to sauce and toss gently to combine. Serve immediately.